How do you Holiday? Are you a Holiday Bazaar shopper, hitting up all the local venues filled with handmade crafters, or do you prefer walking into a store and shopping various items in a curated style? Perhaps you can't decide what to pick for that special someone, and you choose the perfect dollar amount to put on a gift certificate for them to splurge on themselves. Who would Workspace Collective be of we didn't offer ALL of the options? As much as we love working away cozy in our shop, we do step out into the world once in awhile and come to you at these bazaars and pop up shops. Beyond providing a unique and individual shopping experience in-store, we also party, have fashion shows and host workshops. Check out the events below that we have coming up and hang out with us! After all, if you want one-of-a-kind gifts to give this holiday season, we're your brand with lots of artisan designers sharing their story behind every fashion + lifestyle piece. Last year the Hat City Holiday Bazaar was pretty epic. My memories are filled with happy shoppers, a photo booth with smiling kids and friends, a hoola hooping goddess, and way too much delicious food from Rice + Beans food truck. I was so excited when Lynsey said she was down to run this event together for a second year in a row. Seriously - so ecstatic. 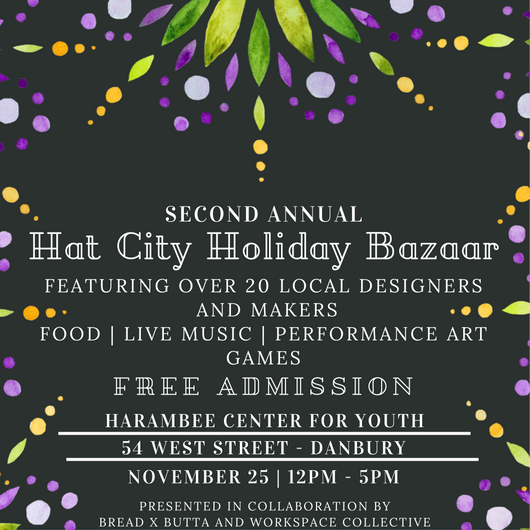 This year we will be hosting the Second Annual Hat City Holiday Bazaar at the Harambee Center for Youth. This is an amazing space dedicated to providing Danbury's youth with safe after school programming, and the event will be a fundraiser for the organization. Ring in the Holiday Shopping Season on Small Business Saturday! At this bigger and better one-of-a-kind shopping event, you will find hand made jewelry, chic fashion pieces, luxe soaps and imaginative toys for kids. The Green Grunion food truck will be keeping our bellies filled, too! Calling all 1KF residents! How fabulous to walk to your community room and do all of your holiday shopping? Take advantage of this "we come to you" holiday vendor fair and get your gift shopping done right at home. Every time we pop up over at 1 Kennedy Flats, I meet such amazing people who are new to Danbury, and I love to hear the stories of these folks' journey through life and how they end up here. Excited to see some old friends and customers and make some new ones this year! The Danbury Public Library is hosting their first ever holiday bazaar! I'm thrilled to be part of this event as we will be taking over the whole first floor of the library. This is no joke.. Each designer will be hosting a 30 minute workshop demonstration for customers to see how their gifts are made by hand. It's like Workspace Collective is literally taking our whole in-store concept and taking it to the library (well I guess we are!). Stay a little later + join in on the Tree Lighting outside of the library to ring in the holiday season as a community! Ring in the Holiday Season with our creative community of artists, designers, art enthusiasts and fashionistas. We will "Celebrate and Shop" as the Cultural Alliance of Western Connecticut and Workspace Collective gather with our friends and family to engage in an evening of holiday shopping specials, performance art, fashion show, live DJ set and raffles! Join us for an epic evening of holiday celebration + register via Eventbrite link below!